The desktop in latter versions of Mac OS X has simplified the Finder window sidebars by showing just a few choices, with the emphasis on the ‘All My Files’ directory rather than individually pointing to your Pictures and Documents folders. If you prefer to see more options from the Finder and Desktop window sidebars, you can customize what is shown in that Finder window sidebar quite easily. For reference, the defaults prior to Mac OS X 10.7 were to show most of the personal folders, like Movies, Music, Downloads, Documents, Pictures, Applications, and the user home folder. Newer versions of Mac OS X are less aggressive at hiding these folders, but even Mavericks still defaults to hiding some of the individual media directories that Mac users may want easy access to. This change has persisted through all modern versions of Mac OS X, from 10.9, 10.10.x, 10.12, 10.1*, etc. 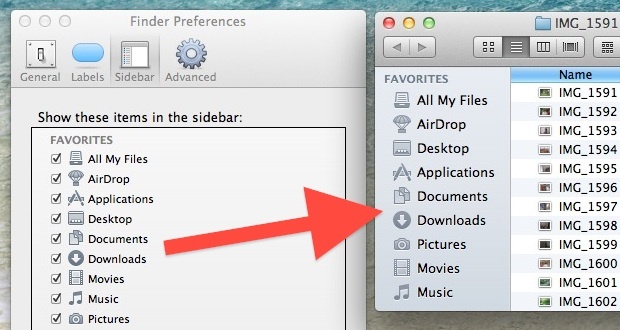 If you’re taking the time to customize the sidebar preferences, make changes depending on how you use the Finder and based upon what files you access and folders you use most often. For example, if you never use the “Movies” folder, you’ll probably want to keep that hidden, but perhaps you use the “Desktop” or “Documents” folders often, in which case those belong. You’ll be able to reduce sidebar clutter and be more productive, and that’s a win-win for any Mac user. This is great. But I really miss having the icons colored like in Snow Leopard. And I would love to be able to group these together. Devices is now at the bottom, but if I add any custom folders (like Dropbox) they just mix in with the other “Favorites”. I’d love to be able to organize it better by creating a separate section like “Favorites” or “Devices”, but call it something different (or even just a divider line) and have my own set of folders there. Without the color, it makes it a lot more difficult to quickly jump to the right place. You can also drag and drop items from the main window onto the FAVORITES (Lion) or the PLACES (Snow Leopard) category in the Sidebar. I too miss the coloured icons (badly, in fact). I can’t wait for Apple to fix this bug. That’s right, I called it a bug, not a feature. As far as the concerns of devices, I too prefer them on top. I got around this by creating shortcuts for the drives and putting them on top. I also added a nameless folder to the list which serves as a divider. Clunky, but gets it done until we can get some kind of spacer. thanks, been on Lion since day 1, but it still has its problems. thanks for helping solve at least one of them. Seems simbl isn’t playing nice at all with lion… Are you still using it Paul? This really isn’t an issue if you perform a clean install of OS X Lion. If you didn’t, the culprit is Snow Leopard. Leopard and Snow Leopard substituted a few of these folders (Music, Movies and Pictures) with Smart Folders in the “Search For” category of the sidebar. That category was removed in OS X Lion and those folders were put back into the sidebar by default. If you installed Lion on top of Snow Leopard, I assume it doesn’t take this change into account, resulting in only Applications, Desktop and Documents in the sidebar.